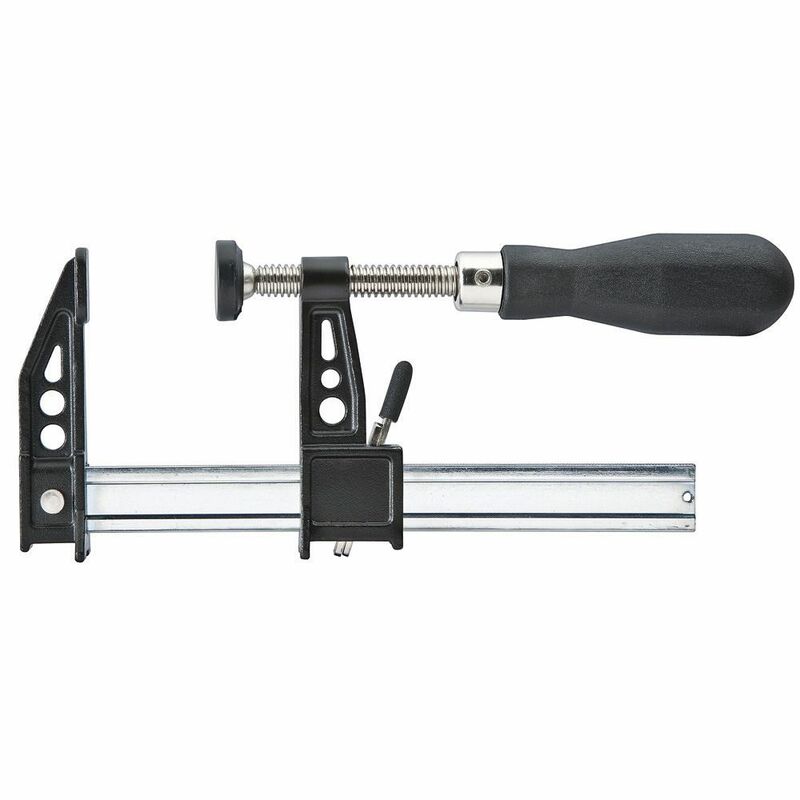 Stable F-Style clamp that stands up on a workbench, with quick-release clutch, zinc-plated steel bar and 2-1/2" throat depth. 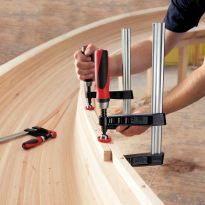 Premium features and incredible value will soon make this new clamp from Rockler your main squeeze for F-Style clamps. With the no-tip stability of the Sure-Foot® base in an F-style body you can stand them up on the bench, leaving two hands free for easy positioning and clamping. The new design features a quick-release clutch that enables easy positioning and also prevents any slippage down the bar. The castings have also been upgraded with larger clamping faces that have been machined smooth for less risk of marring. A thick, comfortable handle provides plenty of leverage and the zinc-plated steel bars are plenty rigid for even the most rigorous clamping tasks. 2-1/2" throat depth. Sold singly. Choose from four lengths: 6", 12", 18" and 24". You can look for F-style clamps at other stores and they aren't as nice as these. I now have 8x 18" sure-clamps. These are so nice. I'm gonna likely get another 8 and then start obsessing on a different length... but man are these handy for just about everything. I would highly recommend adding these to anyone's clamping set. I have bar clamps and the quick release clamps that one squeezes, but these add the straight of the bar clamp and the easy of the quick release ones. Next time they go on sale I will be getting 4 more. These are the best of all F Style clamps i have ever used. Worked as I expected , seems like a good value for the money. Work as good as top name brands like bessey!!! Very good quality, very good duribility. Well made!!! Light weight, easy to use. Great grip! Price/performance for these clamps is excellent. I needed some shorter F style clamp and had been looking when these came on sale (with free shipping). I have to say, this is the best clamp for the money by far. Get this clamp! The quick release is tremendous and the clamp is sturdy as a rock! 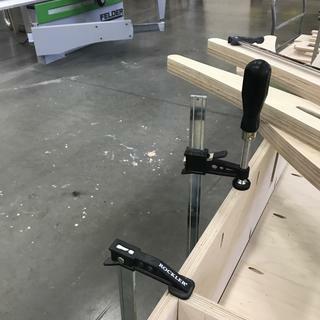 We purchased two of the 12" clamps a couple of months ago and liked them enough to buy a couple of more of these clamps for our Woodshop Club. The edges of the bar make it easy to make non slip clamping. Great clamp. Large diameter handle for better grip. best clamps I have ever used. One solid clamp that does the job 100% well. This is the best clutch style F clamp I've seen. 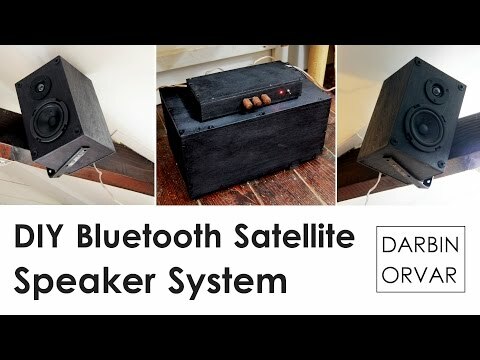 It's well made and is reasonably priced. 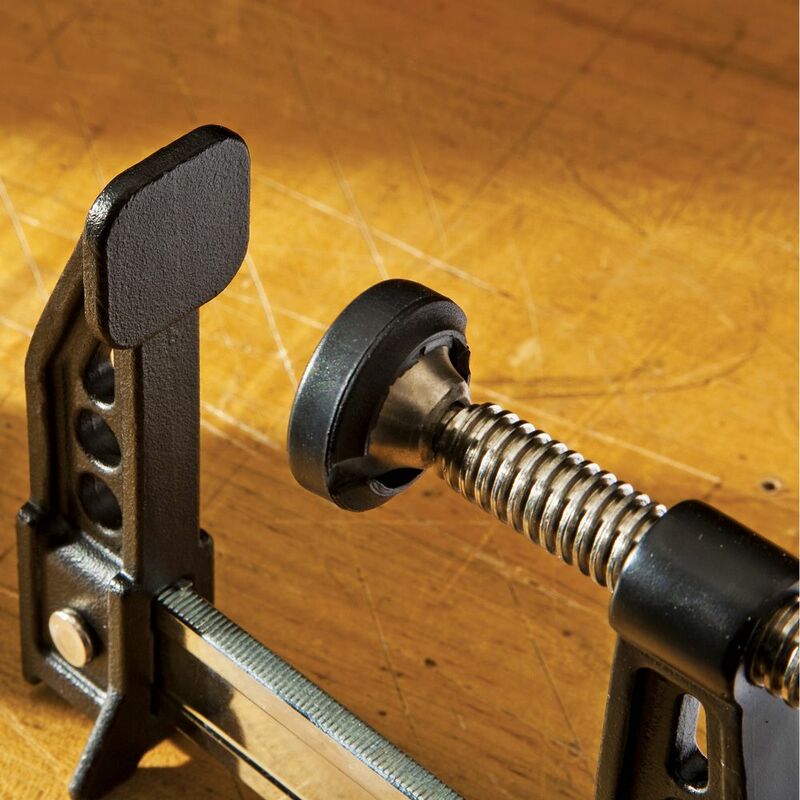 The nonslip handle is much improved over the traditional wood handle of the Bessy or Jorgensen F clutch style clamps. Pads aren't included but I don't think are necessary due to large surface area of the jaws. These clamps are made to last. Super strong and great clampling pressure. I really like it's quick release and the sure foot design lets the clamp stand on its own. I plan on adding more of these to my shop. Only problem with these is I don't have enough of them. Great clamps. I have all three sizes. These are beefy and well made clamps. I have been using these for over 2 years now with no issues or failures. I really like the back legs on them so they will stand on their own on the work bench while I position boards for clamping. this is why you buy a clamp. The price was good so I purchased two for a project I was doing. Very pleased. These are very good for the price. These clamps really do seem to be sturdy and precisely made. They're really handy, too. I don't know why I haven't bought these types of clamps earlier. I love these clamps, I wish I could afford to buy more. I have about a dozen of the 24" and half dozen of the 6". The grip size is large enough for my hands, they have great clamping power and these are the first clamps I grab in my arsenal. Best f-style clamps on the market. Rockler got this right. grate clamps grate price i bought 10 and use them all the time. These are magnificent. They are strong, rigid, and really do stand up straight, simplifying a lot of clamping needs without forcing me to break out the big clamps. I'm considering buying more to replace the "lesser" clamps I have in the shop now. If you need a F clamp. I purchased three pairs of Sure-Foot Clamps. 12", 18", and 24". These clamps work very well and the quality is top notch. If you need a F clamp, these will do the job and I recommend them. I found this clamp to be an easy one with which to work. The ability to slide to a beginning position and then tighten down did not take a lot of pressure. The holding quality has been great. No slippage nor heavy dent into the material. square-shaped grip helps clamp things tightly. Easier to use than clamps with round handles! The clamps are very strong, heavy duty and are easily adjusted with one hand. I will be purchasing more. I couldn't be more pleased with these clamps. I own several Jorgensen light duty clamps and didn't think I needed heavier duty clamps, but once I started using these I hardly ever use the others. The release lever is very easy to use and DOES NOT slip. The large handle gives you a good grip and leverage. 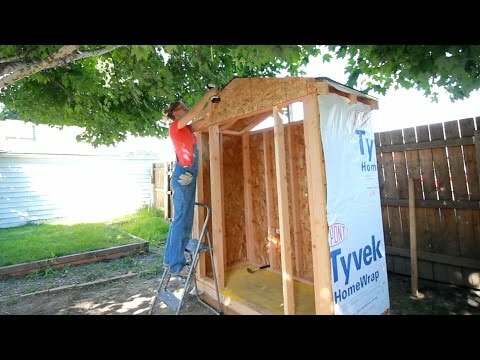 They work as well or better than the more expensive Bessey. Wish they made some longer ones. Would also be nice to have a plastic pad on the stationary end. I glued some cork on mine and it works fine. Would definitely recommend. I've used them once and am satisfied with them. A versatile clamp that works well when it works. I have had to return and replace a clamp that wouldn't hold under pressure. The clamps are heavier duty than expected but do the job. The metal pad on the clamp mars the wood so be sure to use a wood block to protect your work. Finally a clamp with a big handle that I can grasp and tighten. I will eventually replace my older clamps with this clamp. Hopefully pads for the fixed jaw will become available. The bar is bigger than my older clamps, giving it more clamping strength. Needs a soft rubber/plastic on the top of the clamp especially for soft woods. Overall these clamps seemed nice for the money, but I returned mine because they don’t come with the rubber foot pads. You can’t tell this by picture in the catalog. Clamp is rugged and built well. But the screw end does not have a universal swivel joint. So when you begin tightening the clamp, the screw end slides off the surface. I have other F style clamps that have this feature and they work better than this one. Ok, clamps are heavy and take more effort to use than my other set. Maybe overtime clamps will operate smoother. Compared to other bar clamps I have these are cheaply made and I doubt they will last long. 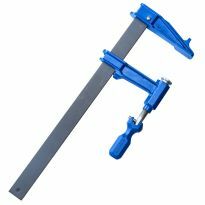 The "F" style is convenient but the screw and clamp mechanism doesn't have the strength and rigidity necessary for this type of clamp. I bought a couple to try out but will toss them when they fail and won't buy more. These look very nice and I was initially impressed, however, the overall assembly flexes much more when tightened than my Jorgensen bar clamps. Also, on one of clamps the pad on the end of the threaded shaft that contacts the wood does not turn freely, so spins as you tighten the clamps Upon closer inspection it looks like it was not properly cut/formed, thus the whole pad spins making clamping difficult. Due to the above issues, these clamps are only used when all my other clamps are already in use. I purchased these clamps thinking that Rockler would have a good product. The first time I used these clamps, they slipped under pressure and were very frustrating. 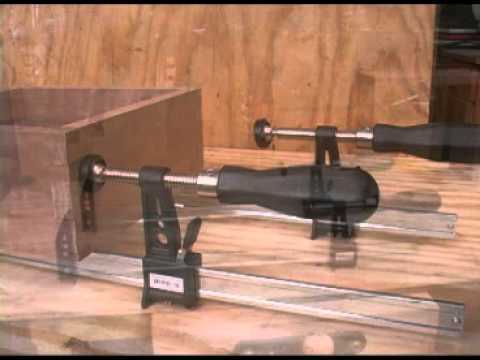 I learned that it is necessary to help the locking devise secure to fully load the clamp. This is a hassle and not needed with my other brand clamps. I have four of these. They will go into my stand by stock, not my ready to use stock. Very disappointed. Bought a couple and they are awesome. I like the idea of the sure foot on an F style clamp, can't wait to try it. 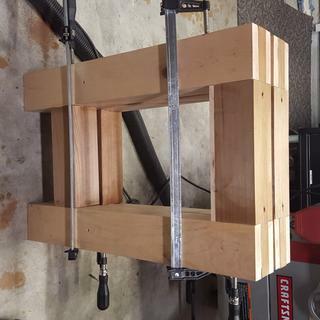 Good sturdy clamps with large handles for getting a tight clamp. Well made too. I have purchased them in the past and found them to be superior to other clamps I have used so I am slowly converting out all my clamps with these. First time ordering F-Style clamps. Starting new shop. Recommended by Wood Whisperer. Building cabinet drawers and looking for a clamp to hold sides together until glue sets. These clamps look like they will be easy to use while holding the pieces of the drawer together. The features are exactly what I want in an f-style clamp. The lever makes it so easy to adjust to the work. Very handy size. Can never have enough clamps. 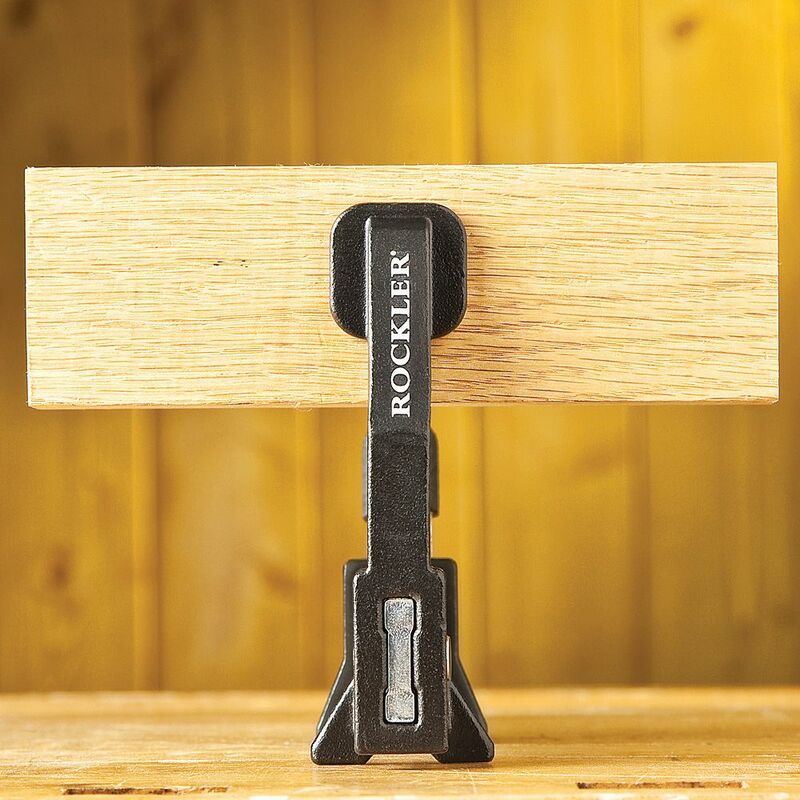 Rockler only carries good stuff! Needed a 24" good quality clamp. Ordered to get the free Bandy-Clamps per an email I got with a promo code, but then the Bandy-Clamps did not show up in the order at all, so I wonder if I will even get them. I hope so, since that is why I even placed the order. Have the 12" for several years. They are great so I expect these to be just as good. High marks in customer reviews. I needed some clamps that would be reasonable and also less than 24 inches in length. Need more and more capacity. My go-to clamp. Sturdier than the others, and I love that big fat handle that lets you get a good grip. I purchased two Sure Foot F-style clamps to compare with older clamps I have used in my shop for years. I was so impressed with their construction and functionality that I ordered more for more set. The Sure Foot clamp has non-marring clamping surfaces and a positive, ergonomic easy to tighten handle. Very well made product. are you able to reverse the pads to obtain pressure outward? What is the clamping pressure produced from this type clamp? BEST ANSWER: Ron, I have no way to measure that, but I can tell you that the handle it much fatter than a Bessy, and you can get tremendous torque. I have dented pine and left marks on both maple and red oak. I now use a caul every time. Two actually. Where is the point of origin? BEST ANSWER: These are made in Taiwan. 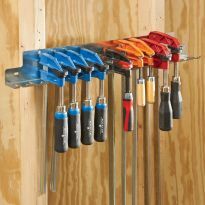 Will they fit in the rockler f clamp rack?